The fervor surrounding smaller tablets like the iPad mini 2 and Nexus 7 appears to have mostly fallen on deaf ears in Japan. However, Sony may finally be getting the message if a brief new product mention in an unlikely place is any indication. TechTastic (Google Translate) turned up an interesting find today while sifting through the user guide for Sony's newest Bluetooth speaker. The guide directly mentions compatibility with an as-yet-unannounced Xperia Z3 Tablet Compact. The discovery can be clearly spotted lurking on page four of the Bluetooth Speaker with Magnetic Charging Pad model BSC10 user guide (PDF link), which outlines what attachment to use with a variety of Xperia smartphones and tablets. The word "Compact" seems to indicate Sony could finally be taking smaller tablets seriously, and the report suggests that particular model could lean closer to an 8-inch display than the consumer electronics giant's previous 10.1-inch models. 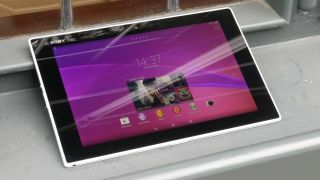 Xperia tablet fans may not have long to wait for the release, with the Xperia Z3 Tablet Compact rumored to be announced on September 3 - right before the IFA 2014 tech show. The report prognosticates the more diminutive tablet will arrive with internal specs largely matching those of the Xperia Z3 smartphone, although Sony will likely cheap out when it comes to the camera quality. Assuming that's the case, that would put a MSM8974AC Snapdragon 801 processor under the Compact's hood, along with 3GB RAM and a 1080p resolution display to top things off. Xperia Z3 Tablet Compact may not satisfy Sony lovers in the market for a 7-inch slate, but it may have to suffice for now; look for this one to pop up on the radar again sometime in the next couple of weeks. Go (virtual) hands-on with Oculus Rift in our review!